The humble truss rod might seem a bit intimidating to the uninitiated, but it’s not really anything to worry about. In truth, it’s simply a very handy part of your guitar whose job it is to control the general curvature of your neck. As the neck is a long and skinny piece of timber, fighting the pull of six strings is a lot to ask for - the truss rod allows us to fight back. The truss rod setting (ie, curvature of the neck) is critical for the entire guitar’s setup - what’s worse is the neck will move with humidity and temperature too so it’s worth keeping an eye on it. We’ve all heard horror stories, and yes it is possible to break a truss rod. If that does happen that’s bad news, but fret not - avoiding it is easy. 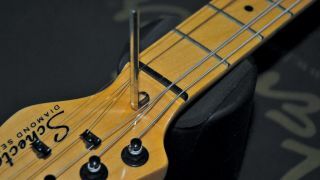 Don’t apply loads of pressure on the truss rod; the odd creaking is normally okay but if it’s getting harder and harder to turn that’s a warning. We’ll show you how to check your progress with a feeler gauge to stay out of trouble - we’ve got your back. 1. Well, where is it then? We know the truss rod is inside the neck but the adjustment nut can be in one of two places, at the headstock end or at the body end. You may have a decorative truss rod cover, a mysterious hole… or the dreaded body-end one (top right) which means having to take the neck off to adjust it! 2. It’s very important that you have the right tool for the job. Your truss rod adjustment nut may have an allen key, a cross head, a small brass nut or the rarer spoke hub type (as found on Stingray basses). Look in the pockets of your case, your guitar often comes with the right tool for the job. 3. On the Ibanez RG we’re using as a test subject, the truss rod’s under the truss rod cover (no surprise!). We’ve removed the locking nut string clamps and retainer bar to de-clutter it. This truss rod adjuster is a brass nut (which is the same as most Gibsons, too), and it will require a 7mm box spanner. 4. It’s time to fit your chosen pack ‘o strings and wind them up to the tuning you’re after. You are free to use any tuning, but remember that the gauge of string and the pitch you’re after will present a certain tension on the neck. If in the future you want to go up or down a size of strings, you’ll need tweak the truss rod to suit. 5. Attach the two capos at the 1st and 15th frets. This allows you to use the string as a straight edge, which will show up the curvature (or lack of) in the neck. Attaching the capos here takes the added height of the nut and the height of the bridge out of the equation so you can be confident. 6. We will measure the gap between the string and the fret top at 6th and 7th fret. Here’s an example of an exaggerated slack truss rod setting with a large gap between 7th fret and the string. This would make a great slide guitar setup but a very poor shredding action! 7. If you’re thinking, “Er… what gap?” this may be because your neck is already bent into a back bow. This pic shows a naughty truss rod setting that is way over tight. The strings are already touching the fret tops meaning they will not play without fret buzzing. This truss rod setting needs loosening to get the necessary forward bow. 8. The mantra ‘righty tighty, lefty loosey’ applies here. Turn your truss rod adjuster nut clockwise and you will add more pressure onto the neck pulling it into back bow. Turn it anti-clockwise and you will loosen the truss rod allowing the strings to pull the neck into a forward bow. Some forward bow is needed for sure. 9. How do you know when you’ve got it right though? Yes, we’ll need the neck to bow forward a little. You can’t have a flat truss rod setting because the string vibrates in an elliptical pattern, we need to mirror this to some degree. Use the 0.006-inch (0.15mm) to 0.012-inch (0.30mm) feeler gauges for this. 10. For this player who is using standard tuning and 0.011s, we’ve gone for the James Bond setting 0.007 inches. Feed the feeler gauge in between the string and 7th fret. Make sure the feeler gauge can pass without lifting the string up. If it’s got too much gap tighten the truss rod, if too little; loosen the truss rod. 11. Doing it by eye is a handy technique for you, too, so you can quickly check pre-gig if your neck is out of whack. Choosing the relief setting is in part down to personal preference based on your playing style. A hard hitter will need more gap (maybe 0.010 inches) while a tickler can get away with 0.006 inches no problem. 12. Operation truss rod is complete! We advise checking your truss rod over the next few days, too; some necks will settle down over the coming days, particularly if your truss rod had to be moved a lot - adjust as necessary. Having worked though our truss issues we can now build a meaningful and lasting setup.